If you read through ISO 9001, you will find 6 places where Documented Procedures are specifically stated to be a requirement. Some folks have been saying how nice it is that the documentation requirements have been reduced. While this is technically the case, it is really a non-issue. For the most part companies are not going to be reducing their documentation significantly if at all. What about new implementations? Will this be a big help to you? No - not really. You will have to have the ‘appropriate’ documents in place regardless. Take for example 7.4 Purchasing. There is very likely that your company will need a purchasing procedure. Often there are a number of purchasing ‘procedures’ (systems) which will require some type of documentation. The absence of the requirement does not exempt your company from having documentation ‘where appropriate’. Where appropriate will be determined by a common sense look at the process in context. 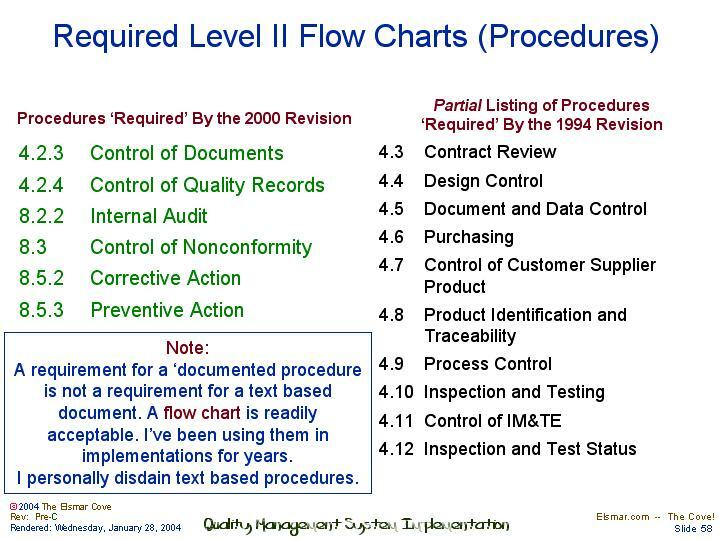 One must remember that to comply with the 1994 version, most companies adopted the Level II approach - make 20 top level procedures or flow charts to address each element of the standard. A requirement for a ‘documented procedure is not a requirement for a text based document. A flow chart is readily acceptable. I’ve been using them in implementations for years. I personally disdain text based procedures.